Here is the beginning of my Fit To Be Tied purse. This is actually going to be a Christmas present to myself, so it doesn’t need to be done by Christmas but it would be nice. I also really want to line it when I am finished. Can anyone give me any tips? 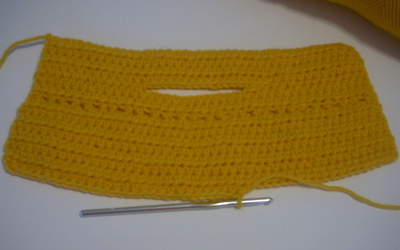 Should I line it before I crochet the sides together? I lined mine after I crocheted the sides together 🙂 Yours is coming along great! I would just measure before you sew together, to get the exact measurements needed for your lining. I don’t have any more advice to add, but just wanted to say it looks like it’s coming along nicely!